From left to right: Lindsey Reeves, UNG director of athletics; Dave Brunk, PBC commissioner; Margaret Poitevint, faculty athletics representative; Leigh Anne Hunter, head women’s golf coach. The University of North Georgia (UNG) Student Athlete Advisory Committee has been awarded its fourth consecutive Peach Belt Conference (PBC) Make-A-Wish award for the most funds raised. The PBC has also announced that the award and one other have been permanently renamed to honor UNG student-athlete LeeAnn Noble, who passed away in March. The awards will now be known as: the LeeAnn Noble, Most Funds Raised, Make-A-Wish Award; and the LeeAnn Noble, Most Improved, Make-A-Wish award. The award names will take effect in the 2014-15 school year. 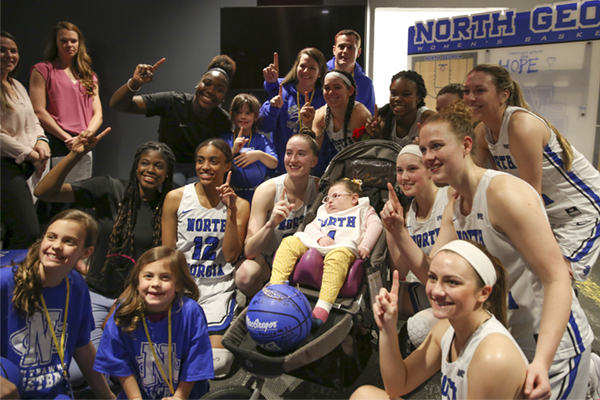 UNG raised $17,000 for the Make-A-Wish Foundation for the 2013-14 academic year — the highest single-season total for any PBC institution in history. It is also the fourth year in a row that the Nighthawks have reached the five-digit mark for their annual giving, and UNG remains the only PBC institution to reach that level. "We are extremely proud of our student-athletes for their incredible achievement as they continue to raise the bar in the PBC," UNG Athletic Director Lindsay Reeves said. "We were also very touched by the PBC's gesture in naming the award after LeeAnn Noble, who was such a big part of the passion our athletics program has for supporting Make-A-Wish." Noble, a former Make-A-Wish recipient, was heavily involved in UNG's Make-A-Wish initiative, and appeared alongside teammate Bridget Sandy in the cover story of the NCAA's Champion Magazine in fall 2013. Noble received a heart transplant at 12 years old; she suffered a heart attack in January 2014, from which she was unable to recover. UNG has also renamed its collegiate golf tournament as the LeeAnn Noble Memorial. "We are very honored by the renaming of the Make-A-Wish award and UNG's golf tournament," said Noble's mother, Carol Ann Gelderman. "I feel strongly about LeeAnn's impact continuing for years and years, and both of these things will help accomplish that." Overall, Peach Belt Conference members raised $49,508, up almost $16,000 from last year's conference total with 10 out of 14 schools giving $1,000 or more. The Make-A-Wish Foundation grants the wishes of children with life-threatening medical conditions. Created in 1980 when a group of caring volunteers helped a young boy fulfill his dream of becoming a police officer, the foundation is now the largest wish-granting charity in the world, with 66 chapters in the United States and its territories. Led by the Division II Student-Athlete Advisory Committee, Division II schools raised $517,465 for the Make-A-Wish campaign during 2012-13, besting the previous year's efforts by almost $50,000 and setting a Division II fundraising record. Since beginning its alliance with Make-A-Wish in 2003, Division II has raised more than $3 million toward granting the wishes of children with life-threatening medical conditions. These wishes can serve as a game changer in children's fights against their illnesses, helping them feel better, and in some cases even improve their condition. For 2013-14, Make-A-Wish is adding a matching incentive to Division II's fundraising efforts. Every dollar a Division II institution raises beyond its 2012-13 total will be matched, up to $1,000, per school.